After the Korean lunch, I took the MTR over to IFC. IFC is the International Finance Centre, a large multi-use complex built atop the Hong Kong Airport Express station. There are two office towers, a hotel, and a nice mall in the complex and it could be a model for the development that might happen around Bangkok’s Airport Express terminal at Makkasan station in the future. While at IFC, I dined at Isola Bar and Grill. Isola Bar and Grill is a two-story restaurant adjacent to the Lane Crawford department store. It has a fantastic outdoor dining deck offering sweeping views of the harbour and West Kowloon waterfront and Thursday was a perfect day for sitting out there. The restaurant was suggested by Angel, a Xangan from Vancouver who comes to Hong Kong frequently on work. Since I had just had lunch and he was flying out in a few hours back to Vancouver, neither Angel nor I was in the mood for a full meal so we settled instead for dessert. Thus, this entry isn’t a fair review of Isola. My hazelnut creme brulee with a scoop of vanilla ice cream. It was okay but I found the hazelnut flavor to be kind of muddy. Angel had a chocolate cake that, if I’m not mistaken, had ground nuts in it. It was the tastier of the two desserts. The service was passable, the dessert was passable, so not much to say there. The view was sweeping, though, and the company pleasant, so that made the appointment well worthwhile. This entry was posted in Uncategorized and tagged Angel, dessert, Dining, food, hong kong, Isola, Xangans by christao408. Bookmark the permalink. No Hong Kong food in Hong Kong? They look pretty though. I guess presentation isn’t everything after all…. @foggysunnymorning – Patience, patience…@ElusiveWords – It definitely was. 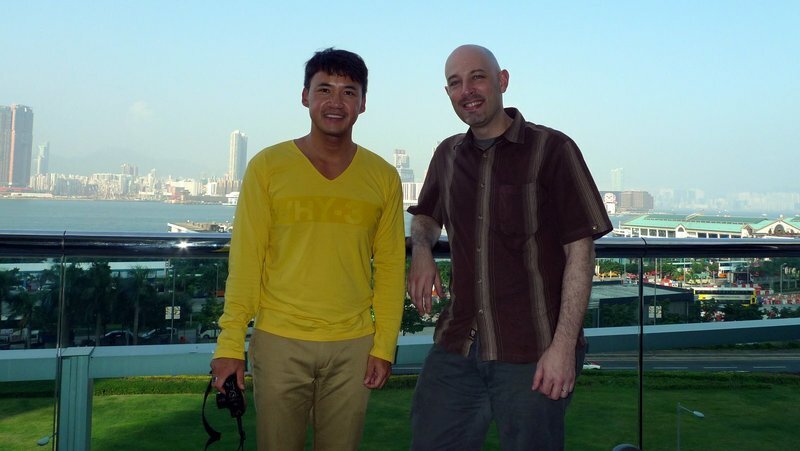 Angel is very nice and I hope he and his partner can make it to Bangkok one of these days. Of course, I say the same about you, Matt. @Redlegsix – The ice cream was the better part of it, in my humble opinion! =D@murisopsis – Yeah, pretty and not tasty isn’t as good as pretty and ugly. My macadamia nut cream pie, for example. 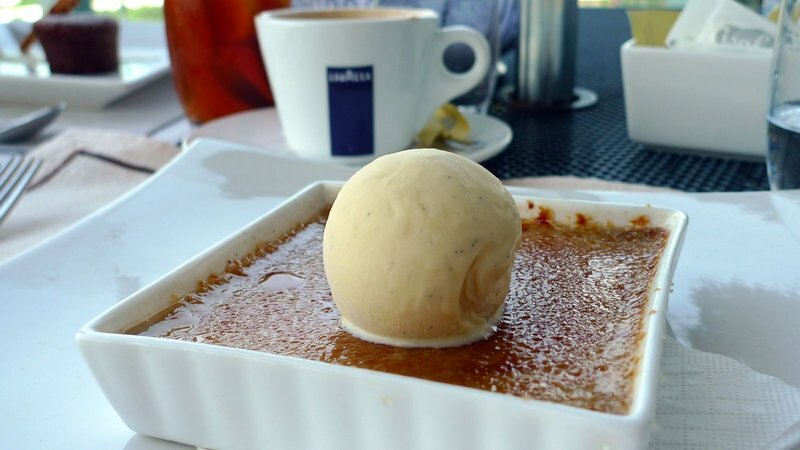 I’m a huge fan of hazelnut, icecream and creme brulee. For some reason, it never occurred to me to put them together! Great food is something I always look forward to in HK aside from shopping =). Food has always been a social occasion for me. Looks like you had good company which made up for what was lacking in the food. Hmmm…I wonder if that’s the place I bought macarons from in IFC on my last visit. The chocolate dessert plate needs some colour! It always seems that the restaurants with spectacular views have B food. But you got together with your friend. That had to be good. Sometimes the view is the nicest thing at an eating establishment. O well what can ya do? 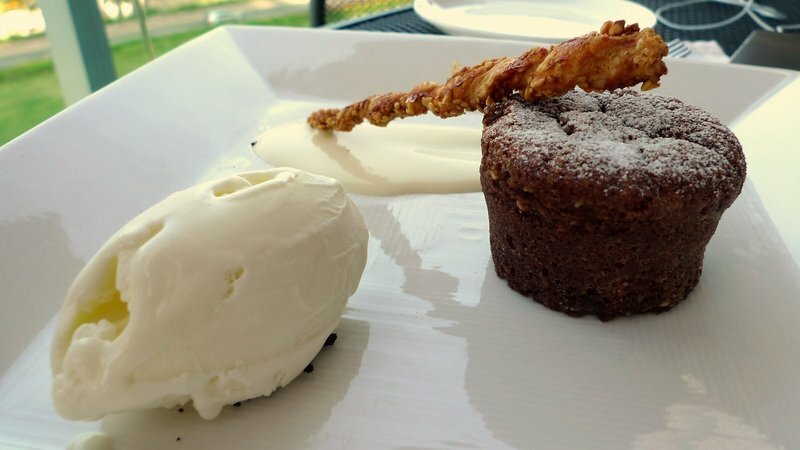 @RushmoreJ – @yang1815 – While there are some exceptions, it does seem like a lot of restaurants with good views don’t deliver in the food department. Maybe you are just so overwhelmed with the view that it is hard for anything else to live up to that standard? @CurryPuffy – Me, too. He’s a really nice guy, which I knew from Facebook but is nice to confirm in person. @ZSA_MD – I’ve been blessed to meet so many nice people through Xanga. @brooklyn2028 – There is a macaron shop in IFC, although I think it has recently closed or changed location or something like that. This place didn’t have macarons from what I saw. @MichellelyNg – I’ll have to go back for drinks some night. What a good view to have with them. @Fatcat723 – That’s very true – good company is what is most important. will possibly go on my list of places to eat when i visit HK coming march. hazelnut creme brulee sounds very tempting. tks Chris, it’s a really nice meet up at Isola that day, and hope I can manage to go to BKK to seee you and Tawn soon!I was planning to go again for dinner last Friday night to give the place a 2nd chance too bad the Typhoon threat ruined the original plan…..
@xx__lamlam__xx – My most recent entry includes dinner in Mongkok, actually. @PeachyApple – In all but flavor! @rudyhou – It is a nice place to visit but one floor up is a balcony open to the public with the same view. Grab a coffee from Starbucks or wherever and enjoy the view for free. @agmhkg – Can you imagine sitting outdoors there in a Typhoon? Ha ha! Let me know when you get down to BKK. Would be a pleasure to see you here.